During a recession or in a sluggish economy when funds to build or buy are in short supply, it is much easier for a business to grow through alliances and partnerships than to try to expand organically. And it isn’t just large companies that can benefit from this ‘ally’ model: research by IBM shows that small and medium-sized enterprises are also increasingly realising that collaborative relationships can represent a flexible and cost-effective model for growth. 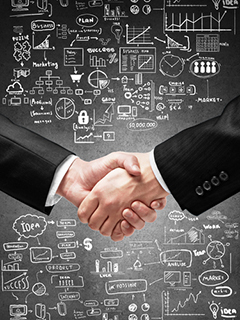 These collaborations and partnerships can embrace suppliers, customers and even competitors. They can offer an alternative route to the in-house development and launch of new products and provide an effective means of responding to a fast-moving marketplace. There are two types of alliance: strategic alliances and tactical alliances. But it is common for alliances to be called ‘strategic’ when they are really tactical and these are often negotiated by two parties who already know each other. The question to ask is will the alliance change the strategic direction of the business and be lucrative? The biggest challenge with such partnerships is building trust. Half of all respondents to a survey by the Economist Intelligence Unit said that trusting corporate partners to share information is the toughest aspect of a new business relationship and that strengthening personal relationships is essential in establishing this trust. This is true of businesses of all sizes. Our own research and experience dispels some of the most commonly-held beliefs about alliances and partnerships. Alliances are about people pure and simple: There is a widespread belief that collaborations between companies ultimately boils down to the relationship between a finite number of people: hence alliances are fundamentally concerned with whether people get along. Whilst it is true that chemistry is an important element in most strategic alliances and that the cultural dimension is important, it is also evident from our experience that it is only one of many important considerations. Knowing yourself as an organisation: If you were unclear what you wanted to achieve and why you were entering into a relationship, it is unlikely your partnership is going to be a success. You need a clear understanding of the landscape and how the alliance will help from the outset. It isn’t just a hunch or a tactical sales relationship. It is also about culture: recognising what sort of culture you have as an organisation and also how this affects your choice of partners. Define the business case: A clear business case is the foundation for every alliance. This should state the return we expect from the relationship, when we should expect it and where it will come from. Of course this is a partnership game so there needs to be an end-game that is attractive to both parties. Is the goal to double sales targets? Is the only way this can be achieved through partnering? Building bricks with no straw: This is the syndrome of expecting alliance professions to be able to develop and manage successful relationships with no support. It is not uncommon that there is an expectation of outstanding results with no training, partner support systems, methodologies, templates or tools. The reality is that no matter how good or alliance-savvy an individual might be, he or she needs a support infrastructure. Identifying key stakeholders: You would be surprised by how much time it can take companies to interact successfully with each other. Even in a situation where both are fully committed to interaction, the apparently simple process of identifying the right person to speak to can be fraught with difficulties, which in turn impacts the development of the relationship. Clear channels of communication are vital to the success of any alliance. Are you speaking the same language? We often find situations where relationships are damaged by a simple misunderstanding about a phrase or terminology. This may seem like a small thing but it is actually responsible for significant lost value and time in many strategic alliances. If you are speaking a different language to your partner, or the same language with different meaning, you are probably heading for discord and trouble. Collaborative negotiation: Negotiation in alliances is not the same as negotiation in other aspects of business life. The difference lies in the distinction between collaborative and adversarial approaches. In an alliance, compromise is failure whilst in most normal commercial negotiations compromise is seen as the natural end point achieved through balanced negotiations. Partner accountability: Partners need to be absolutely clear as to the scope and degree of their accountability in the alliances relationships. Best practice is to jointly develop clear ground rules that leave all parties in no doubt as to what is expected of them. In many cases these rules are in no way legally binding, but rather reside in charters or codes of behaviour or Memorandums of Understanding and Principles (MOUP). This clarity of expectation from everyone involved greatly reduces the chances of misunderstandings. Process for team problem solving: Strategic alliances are first and foremost active collaborations. As a result, alliance managers on both sides should be encouraged not to think in terms of ‘my’ problem or ‘your’ problem but ‘our’ problem. Remember too that a problem shared is a problem halved. In this way the relationship will benefit from a higher quality of problem-solving. Posted in: Sharing, Sharing success.